Getting into the real estate market can be a daunting task if you don't know the basics of purchasing or selling property. The real estate transaction affects many parties; from the real estate agent helping you with the purchase of the property to the city department collecting your annual property tax. The real estate industry is one of the main economic drivers in modern society. Buying a Home - The U.S. Department of Housing and Urban Development provides a comprehensive guide to the homebuying process. HUD also has special homebuying programs for first-time homebuyers and civil servant workers. Frequently Asked Questions on Home Inspections - The American Society of Home Inspectors provides information on the home inspection process. 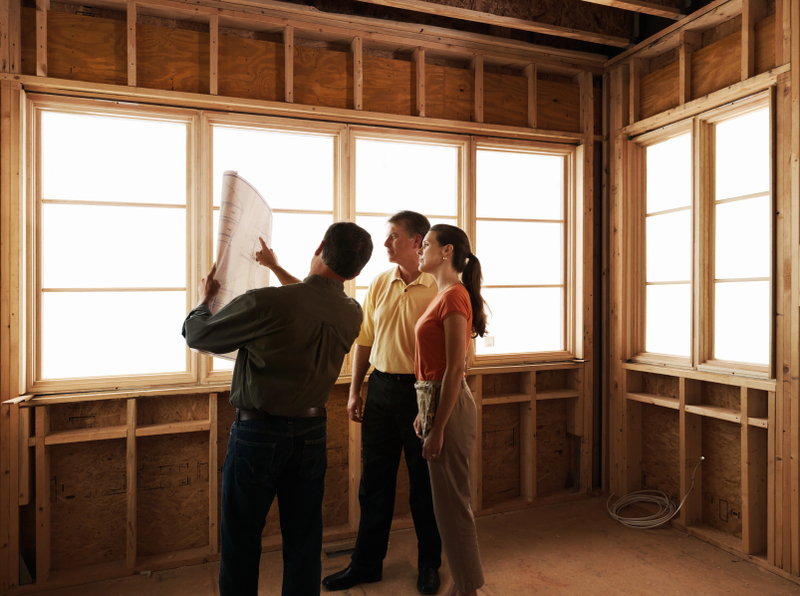 The Frequently Asked questions addresses the standards that home inspections should meet. Selling Your Home? Tips for Selecting a Real Estate Professional - The Federal Trade Commission's guide “Selling Your Home? Tips for Selecting a Real Estate Professional' provides consumers a list of questions that should be asked when interviewing a real estate agent to sell a home. Homes For Sale by the U.S. Government - The HomeSales.gov website is a database of residential property for sale owned by the U.S. government. You can perform a search by state, city, bedroom and bathroom size for homes you are interested in purchasing. The Workforce Mobility Council - Worldwide ERC is a workforce mobility association that oversees employee transfer domestic and abroad. Professionals in HR, real estate, finance, military, and consulting can obtain training and professional development services. International Real Estate Digest - The International Real Estate Digest provides over 50,000 links to real estate related websites across the world. Appraisers, inspectors, lenders and sales persons benefit from the resources listed on this site. National Fair Housing Advocate Online - The National Fair Housing Advocate Online is a website dedicated to providing resources regarding housing discrimination to fair housing advocates and the general public. USC Lusk Center for Real Estate - The USC Lusk Center for Real Estate produces reports on real estate topics that include urban economy and public policy. Students and faculty research current real estate trends to address critical and timely issues. UCLA Ziman Center for Real Estate - The UCLA Ziman Center for Real Estate is committed to advancing leadership in the real estate industry through research and education. New York University Schack Institute of Real Estate - The Schack Institute of Real Estate is one of the country's leading center of learning in New York that serves the real estate and building industries. The Institute holds national conferences on capital markets and REIT mergers and acquisitions. Real Estate Program, Kellogg School of Management - The Real Estate Program at the Kellogg School of Management is designed to ensure students have a thorough understanding of the theory and practice of the real estate industry. This program is located at Northwestern University in Illinois. Frank L. Burns School of Real Estate and Construction Management - The Frank L. Burns School of Real Estate and Construction Management at the Daniels College annually hosts a visiting real estate scholar to participate in classroom discussions and off-campus activities. The school also holds the NAIOP Challenge competition. Portland State University, Center for Real Estate - Portland State University's Center for Real Estate strives to foster innovation and creative development in students studying real estate. Upon graduation, students are prepared for a career in real estate. Chicago School of Real Estate - The Chicago School of Real Estate' Urban retail Properties professional Development and Research Center provides a comprehensive library of real estate industry book, periodical and training sources. Tax Tips - Real Estate - The Internal Revenue Service provides information on taxes pertaining to real property. Housing Topics - The United States Census Bureau provides data on the housing market on topics that include homeownership rates, housing vacancy rates, housing affordability and construction data. Government Sponsored Enterprises - The Federal Housing Finance Agency's website provides background information on the Fannie Mae and Freddie Mac housing finance programs. Help for Struggling Homeowners - Making Home Affordable programs offer alternative options for homeowners facing foreclosure. Homeowners may qualify to have their mortgage modified, deferred or refinanced. FEMA Housing Portal - The federal Emergency Management Agency's Housing Portal helps families that have been affected or displaced by a natural disaster find a place to live. The searchable database programs resources that are available in each state. Historic Properties for Sale - The national Trust for Historic Preservation provides information on historic properties for sale across the United States. You can search by state and property type. Comprehensive Housing Market Analyses - The HUD User website provides data on housing markets across the U.S. You can find data sets that include income limits, fair markets rents, and thematic maps. U.S. Bureau of Labor Statistics - The U.S. Bureau of Labor Statistics provides information on employment conditions across the United States. This can help you determine employment outlook when relocating across the country. Land Use Law - Cornell University provides information on land Use laws in America. There are links to federal material, state statutes and judicial decisions. Real Estate Law - Guide to Real Estate and Property Law - HG.org, LLC provides a comprehensive list of links pertaining to real estate law in the U.S.
Real Estate Law Community - LexisNexis is a database of legal resources that includes laws pertaining to real property. information is provided on a subscription basis. Real Estate Laws in Your State - The Department of Justice has compiled information for real estate law in each state. You can click on the state you live in to learn about laws in your area. FDIC Law, Regulations, Related Acts - The Federal Deposit Insurance Corporation outlines the Truth in Lending Act on their website. The Final RESPA Rule - The Real Estate Settlement procedures Act insures that consumers are provided information on the costs of borrowing money for the purchase of a home. This presentation outlines RESPA requirements. ABA Section of Real Property, Trust and Estate Law - The American Bar Association provides is a national forum for lawyers worth over 25,000 members. The ABA publishes real estate law books on topics ranging from estate planning to the real estate transaction. Basic Zoning Laws - The Small Business Administration provides an overview on zoning laws. Lincoln Institute of Land Policy - The Lincoln Institute of Land Policy is a leading resource for issues concerning land use, regulation and taxation. Areas of study include planning and urban form, valuation and taxation and international studies. Urban Land Institute - The Urban Land Institute is a nonprofit organization committed to providing real estate research and education. Efforts are supported by its members. American Planning Association - Created in 1978, the American Planning Association is a nonprofit organization that provides leadership in the development of communities. City & Regional Planning Research Guides - A resource of city and regional planning publications. Smart Communities Network - Smart Communities is an organization committed to providing information on sustainable development. Guidelines For Land-Use Planning -The Guidelines for Land Use Planning is a publication of the Food and Agriculture Organization of the United Nations. Land Use Planning Handbook - The U.S. Department of the Interior Bureau of Land Management provides a handbook for local government. Community Design/Land Use Planning - The National Association of County and City Health Officials provides information for government officials on real estate topics. Mortgage Bankers Association - The Mortgage Bankers Association represents over 2,400 professionals in the real estate finance industry. National Association of Home Builders - The National Association of Home Builders is a trade association that helps to promote policies that improve housing. National Multi Housing Council - Based in Washington, DC, NMHC represents apartment firms in the U.S. The Appraisal Foundation - The Appraisal Foundation is a nonprofit organization that is dedicated to the advancement of valuation professionals. Institute of Real Estate Management - The Institute of Real Estate Management is an international community of real estate managers of all property types. The American Institute of Architects - The American Institute of Architects is a professional membership association for licensed architects based in Washington, DC. Certified Commercial Investment Member - CCIM is part of the global commercial real estate network and recognized as an expert in commercial real estate. Counselors of Real Estate - Counselors of Real Estate is a membership organization serving 1,100 members. Real estate advisers can obtain professional development and training services. Mortgage Glossary - Financial terms in the real estate industry. Legal Dictionary - Laws pertaining to real property and other issues. Buy Vs. Rent - Calculator helps consumers determine the cost of renting versus buying. Glossary of Financial and Business Terms - Glossary to help you become familiar with financial terms. Glossary of Commercial Real Estate Terms - Glossary to help you become familiar with commercial real estate terms. Renters' Rights & Tenants' Rights - Renters and tenants can determine if their rights have been violated. Journal of Real Estate Finance and Economics - Publication provides information on residential and commercial real estate purchases. National Mortgage News - Up-to-date information in the mortgage industry. Journal of Housing Economics - Economic research on housing-related topics. The Real Estate Economics Journal - Real Estate Economics is considered the premiere journal for real estate industry topics. Inman News - News for real estate professional and mortgage brokers. Planning Commissions Journal - Includes articles on economic and fiscal benefits of affordable housing. Review of Economics and Statistics - Empirical research on economic topics. Area Development - Founded in 1965, Area Development Magazine is the leading executive magazine covering site selection and relocation.